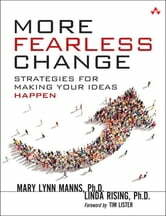 In their classic work, Fearless Change, Mary Lynn Manns and Linda Rising interviewed successful leaders of change, identified 48 patterns for implementing change in teams of all sizes, and demonstrated how to use these techniques effectively. 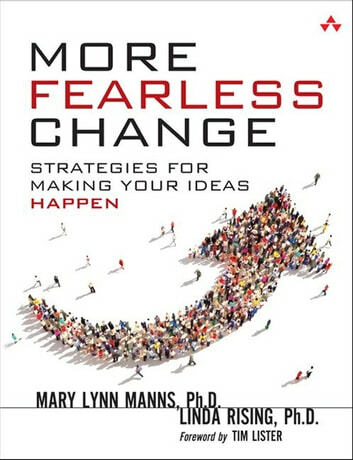 Now, in More Fearless Change the authors reflect on all they’ve learned about their original patterns in the past decade, and introduce 15 powerful, new techniques–all extensively validated by change leaders worldwide. Manns and Rising teach strategies that appeal to each individual’s logic (head), feelings (heart), and desire to contribute (hands)–the best way to motivate real change and sustain it for the long haul. More Fearless Change reflects a profound understanding of how real change happens: not instantaneously in response to top-down plans and demands, but iteratively, through small steps that teach from experience. Best of all, as thousands of change agents have already discovered, its patterns are easy to use–and they work.